Plaque is a sticky biofilm that adheres to teeth. It’s primarily made up of bacteria. If plaque is allowed to stay on your teeth, it will harden into tartar and begin to eat away at the enamel, causing dental caries or cavities. You can remove plaque with a toothbrush and floss, but you’ll need to see your dentist to get rid of tartar, as this substance is much harder. You can learn more about plaque when you watch this video clip. It explains that various bacteria specialize in different functions. Some bacteria are exceptionally good at sticking to the teeth, while other types specialize in dissolving the tooth enamel. You’ll also learn why dentists fill in more cavities on the back teeth compared to the front, and how poor dental care can lead to loose teeth and tooth loss. 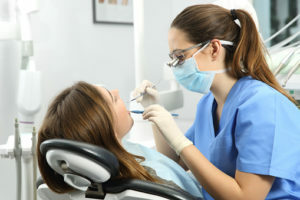 Residents near Hazlet can get a professional teeth cleaning at Glenwood Premier Dental. Call (732) 264-4477 today to schedule an appointment. Restorative dentistry refers to any approach a dentist uses to replace a missing tooth or restore a natural tooth that is missing part of its structure. As you might imagine, restorative care is a broad category of dentistry that encompasses numerous types of treatment. Your dentist will help you choose the most appropriate restorative option for you, based on your specific oral health needs. What are direct and indirect dental restorations? Inlays and onlays are both types of restorations that are suitable for treating tooth decay. They can also be used to treat minor cracking or fracturing as an alternative to crowns. An inlay fits within the tooth’s biting surface. An onlay covers part or all of the chewing surface. Both of them can be made of porcelain, composite resin, or gold. All crowns are made to fit permanently over a damaged natural tooth. The crown itself is like a cap that looks just like a tooth. There are different materials that can be used to create a crown in the laboratory, such as porcelain, acrylic resin, and gold. Another option is a CapTek crown, which is a premium quality of crown. CapTek crowns tend to be more durable and stronger, with less of a risk of tissue sensitivity. You’ll find a comprehensive range of dentistry services at Glenwood Premier Dental. In our dental office in Hazlet, we offer restorative care, implant dentistry, and cosmetic dentistry to help our patients get the beautiful smiles they deserve. Call (732) 264-4477 to request our next available appointment. Dental implants and bridges are both types of restorations that dentists can provide for patients who have missing teeth. It’s also possible to combine these two treatments, which is known as an implant-supported bridge. Check out the following information and talk to your dentist to find out if an implant-supported bridge may be a good choice for replacing your missing teeth. A traditional dental bridge consists of one or more artificial teeth. They are secured to the natural teeth on either side of the gap to hold the bridge in place. Although traditional bridges are a good option for many patients, there are some downsides. An alternative is an implant-supported bridge, which is held in place by dental implants, rather than by the adjacent natural teeth. One of the main components in this dental restoration is the implant itself. The implant is a small titanium post. Your dentist will place it directly into the jawbone. Depending on your specific needs, you may have multiple implants placed to hold up one bridge. The component that fits on top of the implant is the abutment; this is a small cylinder that screws onto the implant to act as a connecting piece between the implant and the restoration. The bridge is the visible part that looks like your natural teeth. It’s made of connected porcelain crowns, which are fused to a substructure made of metal. Implant-supported bridges are a good choice when it’s not ideal to have multiple individual dental implants. As a hypothetical example, let’s say that Patient Joan has three missing teeth, and she also has bruxism, which means she grinds her teeth together. If Joan gets individual implants, the force of the grinding can cause them to fail. But if Joan gets an implant-supported bridge, the force will be evenly distributed across the bridge, helping to prevent excessive wear and tear. Implant-supported bridges can also be a good choice for people with areas of thinning jawbone mass. Implant dentistry is one of our specialties here at Glenwood Premier Dental. Our implant dentistry specialists in Hazlet will do a thorough exam before recommending the specific type of restoration that is best suited to your needs. New and current patients can reach us at (732) 264-4477.